Ever since I first started looking into purchasing a 3d printer one of the things that always fascinated me was the ability to print with different materials so I was exstatic when one of my family members gifted me a spool of Copperfill by ColorFabb. This interesting filament has a large portion of copper particles within the plastic (80 percent I believe but dont quote me on that.) Obviously we arent talking about literally forging metals with 3d printers at this point but you are at least able to mimic the same qualities of metal primarily for artistic purposes. With all of that said, it should be understandable that this filament also doesnt come cheap! So I have been very cautous over what I should test this stuff of first. 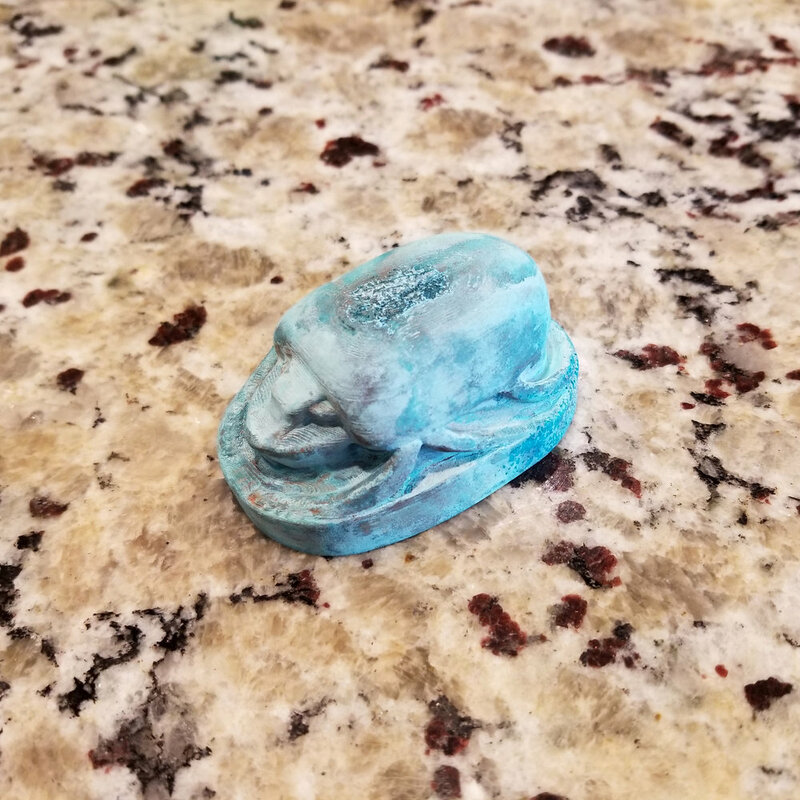 After some mulling over I decided I really wanted to print an authentic Egyptian style scarab but none of the sites offering free content really had what I was looking for until I came across a series scan of one from the British Museum. The problem though was that it was pretty beaten up and had parts missing so I fixed it all in Zbrush by cleaning up one section, mirroring it then projecting the other side. Mirroring wasnt really an option because of the fact it was a real sculpture there was not true symmetry, besides symmetry is boring! This is a modified version of the one I printed that has exaggerated features that wont be lost to printing/sanding. I really wanted to see what extent this filament could go so I did some sanding and then threw it in a vinegar and salt solution overnight, this was the result. Now we are getting somewhere! Putting the final touch I bought some steel wool and Brasso to polish it with. Overall I am pretty satisfied withe the results, I think it looks pretty neat. Next I might try to add some antiquing to add move contrast to the details, perhaps I will save that for my next print!